Living in its own shadow. Lara Croft has been a gaming icon for over twenty years, spanning numerous reboots and three major motion pictures. The character has been portrayed by several actresses, all doing their part to bring the character to life in one form or another. When Crystal Dynamics rebooted the franchise some five years ago, it reintroduced us to Lara Croft all over again. This reboot presented a more modern take on the character that did much to strip away the designs of her past and one that allowed us to witness her journey to becoming the eventual Tomb Raider. With the latest game of the trilogy in the hands of another developer, Eidos Montreal, Shadow of the Tomb Raider offers very little in the form of change and while entertaining, it is almost the same game we’ve played before. With Lara hot on the trail of Trinity, the shadow organization responsible for the death of her father, she travels to Cozumel, an island in Mexico that is currently celebrating Día de Muertos, aka, “Day of the Dead”. It is here, among the local celebration, where Lara will make a startling discovery that will put the entire world at risk, an event that can only be stopped by doing what she does best; tracking down a long-lost artifact. With Shadow of the Tomb Raider being the finale to this rebooted trilogy, Lara will finally discover the truth behind Trinity and discover much about herself in the process. While I enjoyed Lara’s showdown with Trinity, I did feel that the organization got the short end of the stick in terms to how it was included here. While I’m not exactly sure what I was expecting, I’m almost convinced that neither did Crystal Dynamics or Eidos Montreal. There are certainly aspects to the story and how it ended this current narrative that I adore, but overall, It certainly isn’t the best tale they could have told. The Lara featured here is a far more complicated character than we’ve been shown previously. There is a lot here that can actually paint her as a villain, depending on the point of view you take with her characterization. This Lara can come across as wildly selfish and only looking to serve her best interests. This leads to Lara’s obsession to be the hero, to come across as being the only one who can set things right. The game does a great job at showing us what it has done to her state of mind and her relationships along the way and while it doesn’t quite address everything by the time the credits roll, it does a serviceable job at letting the character grow and gives us a version of Lara that has come a long way from being the one-dimensional heroine we first saw some two-decades ago. During this adventure, Lara will not be alone. Jonah, her best friend, will be consistently present during much of the game. While some of that is via a two-way radio, his presence is still very much felt throughout the entire experience. While Lara will converse with several characters along the way, it is this relationship that carries much of the emotional weight felt in the title’s writing. Eidos Montreal was right to make this partnership a focus of the narrative as it stands out as one of the finer aspects of the game and the story as a whole. While you will start your adventure in the streets of Mexico, it isn’t long before Lara and Jonah follow a clue that leads them to Peru. Much of your adventure will be centered around areas that break away from a few central hub locations. While the environments offered here may have an open world approach, think of these more as connected locations than one sprawling open-world. In fact, due to how certain weapons and items work, you might be more on the money by describing this as a third-person Metroidvania due to how you will revisit locations again to further dig away at their secrets. The environments are filled with collectibles, challenges, and several ways to gather up crafting materials such as breaking down branches, collecting spiders, or putting your bow to good use via the nearby wildlife. With how strong of an emphasis the game puts on crafting, I wished the amount you could hold was far more than what is currently offered as I kept getting rather annoyed at Lara consistently mentioning that she was full up every time I approached some crafting resource. While some of that can be fixed with crafting new equipment, it only marginally helped in the long run. The hub locations, which are local villages populated with people, are bigger and livelier than the series has seen before. In fact, I was somewhat surprised at how large some of these locations were, especially the second village you encounter. These locations are filled with numerous NPC’s that you can chat up and learn more about them or their culture, locate special points of interest on the map, or take on fairly lengthy side quests to gain not only some much-needed experience, but in some cases, be rewarded with new weapons, items, or outfits. To aid in the addition of new weaponry and equipment, Lara has access to merchants that will buy excess resources or trade in the gold and jade you find along the way. For those looking to uncover each and every item the game has to offer, the map does feature a wealth of icons to track down and it will keep track of what you have completed and what is left to uncover. 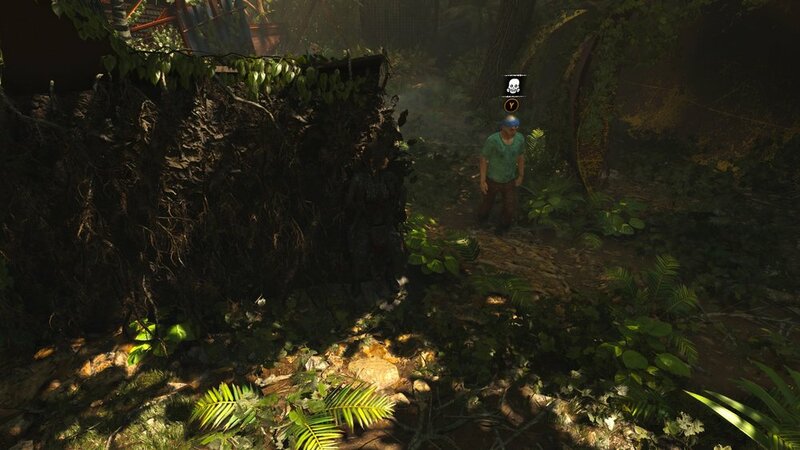 One of the biggest complaints from the previous two games were the lack of tombs to explore and Shadow of the Tomb Raider offers far more of these puzzle-like locations in response. Challenge Tombs appear far more frequently, identified by yellow painted markings as you stumble upon them. These locations feature an elaborate puzzle that has you moving reflective discs, rotating pillars, moving swinging spiked chandeliers with wind gusts and several other puzzle type mechanics. These reward you with new abilities within the skill tree system I’ll be discussing shortly. Apart from these multi-layers efforts, there are also crypts that grant outfit rewards that are smaller in nature but hidden just as well. Lara still retains her hunter vision that is the same mechanic we have seen in a dozen games before. By pressing in the right analog stick, the environment goes dark while the collectibles, points of interest, and the numerous threats around you glow a bright yellow, or red depending on the type of threat. Now, this vision does allow you to get the most out of the environment by seeing what you need to collect or where to go, but I feel the game relies far too much on its use. While you can learn a skill that has the resulted glow last a lot longer after its been pressed, I found I had to keep using it constantly to track down the items around me as they often blended far too much into the background. I will state that this has always been an issue with this type of “vision” as it tends to favor the use of a mechanic that puts a drab filter over its gorgeous visuals. Ever since the first of this rebooted series, combat has been a required skill set of this far more violent version of Lara and Shadow of the Tomb Raider doesn’t look to change that in the slightest. In fact, Lara is far more bloodthirsty than ever before with an added layer of stealth and brutality. Lara can perch on branches and fire off an arrow while leaping down behind the branch to then hang and choke out her victim, and while that trick is very cool to pull off, the game didn’t offer me a lot of chances to use it. One new mechanic that is consistently present is by slapping a whole ‘lotta mud on Lara and using it to blend into the environment by slinking into a wall of vines and using that layer of invisibility to pull unsuspecting foes into a quick dirt nap. While you will have an assortment of assault rifles, handguns, and shotguns, all of which you can upgrade as well, I found the bow to frankly outperform them at every turn. You can craft special arrows that cause nearby enemies to become confused and you can end up having one of them caught in a shootout with their allies, thus thinning their numbers. The bow is also silent, giving you more effectiveness to remaining undetected. I will state that the bow and weapons are far less effective up close and given that a few enemy types tend to charge at you, the combat does start to fall apart as the close combat skills given to Lara are highly ineffective. Apart from the weapons that Lara will wield, I found that rigging up bodies with poison traps to never get old and became one of the most used methods of combat in my arsenal. As you level up you will earn skill points to put towards a variety of skills. Lara can apply these points into three categories; Seeker, Scavenger, and Warrior. Seeker will gain you lower prices at merchants, better use of your survival instincts vision, and earning more resources upon pick up. Warrior allows you to upgrade your weapons further, craft fear arrows, reduce incoming damage from enemies or from a fall. Finally, Scavenger has you applying mud for camouflage, longer held breath under water and allow for your health to regenerate faster. By the time that I wrapped up my initial playthrough, I had only a half dozen left to unlock, giving me a fairly effective means of taking down any threat that came my way. There are a select few skills that unlock once you have completed challenge tombs, thus giving you another reason to explore everywhere you can. The traversal systems in play have been somewhat hit and miss not only in this rebooted trilogy but countless other Tomb Raider games in general. Areas that are able to be scaled are indicated with a white painted indicator or a texture to the wall should you need to jab your climbing axes into them at the last second. Lara can also rappel down from these spots and swing to safety and you’ll also locate equipment to climb upside down like a certain wall-crawler. There are also a few sections where you’ll need to jump and throw your climbing axe in order to latch onto a branch or some other aspect of the environment to swing across a wide gap. While more often than not, the climbing and jumping system work, but when they don’t, it is almost always due to having to be far too precise on where to jump and at what angle you should be facing. The scenes that feature Lara falling to her death or getting eaten alive by wolves are back in full force and you’ll be seeing them far more often due to how touchy certain aspects of the traversal system can be. Shadow of the Tomb Raider is hands down the best looking Tomb Raider game to date. While there is a bit less variety in the locations you visit, there is still a lot to see here. As you explore deep into the Peruvian Jungle that makes up a significantly large chunk of the game, you will explore almost as much on the surface as you will inside various crypts and tombs. The village locations are rather large, especially that of Paititi, the largest location in the game and one that is based upon a supposed real world lost city. With the ability to swap costumes, each of which loaded with their own set of stats, you can visually change up Lara several times over as there are a ton of costumes to unlock. Should you want to rock it old school, you can actually swap the Lara character model to that of the original, allowing you to see how the character has evolved visually. Shadow of the Tomb Raider also sports a Photo-mode that offers all the bells and whistles you come to expect from such a feature. I did find that some of the mouth animations looked a little odd, but otherwise, this is a gorgeous game on any platform. Ok, so I’ve talked about the story, weapons, crafting, traversal, and everything that has a big part to play in this game and while there are small additions to what Shadow of the Tomb Raider brings to the series, nothing is terribly groundbreaking and the experience feels far too similar to that of the previous two games. Hell, Lara still rocks the same animation of her addressing her pony tail after exiting a body of water. While Eidos Montreal has delivered a very satisfying finale to a mostly mechanically sound game, it just doesn’t feel fresh in any significant way and becomes the poster child for “renovation” rather than “Innovation”. While not every sequel needs to innovate in the sense of completely retooling what has been offered before, as was the case in Assassin’s Creed: Origins, successful sequels have added on to competent mechanics and built new systems that enhance and better the overall gameplay. Shadow of the Tomb Raider feels as if Eidos Montreal put the development of this game on safe mode and while “more of the same” can often be looked at as either a good thing or not, its worth noting that if the previous two games didn’t excite you, then chances are this one won’t either. While I wasn’t expecting the game to have terribly challenging encounters with the dozens of enemy forces you’ll have to contend with, the AI present here is certainly lacking. I’ve had soldiers open fire while standing beside explosive barrels and there is an encounter about midway through the game where Lara is required to climb a large structure while she is surrounded by numerous enemy forces, none of which can seem to even hit her, despite the clear advantage they have. It is a fun event sure, but one that is heavily scripted in your favor. I also lost count of how many times I was able to stealth kill people in plain sight or a foot away from another solider, even with how loud and brutal the attack was. So many of the kills also made me question why they didn’t yell out in surprise or how easy it is for Lara to knock someone out who clearly never suffered any sort of bash to the skull. 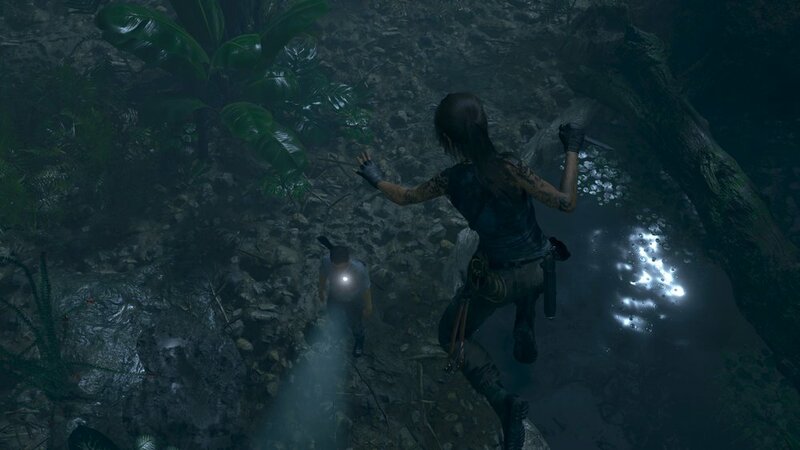 Even the animation from hanging them over the branch is confusing as to how it actually kills them and it simply looks like Lara is pulling the rope around their arm. While nothing here ruins the experience in any real way, it certainly shows that this game lacks a considerable amount of polish and refinement. Shadow of the Tomb Raider mostly suffers from a lack of the series moving forward. A change to a new developer could have seen the series expand out and take some risks, but ultimately, Eidos Montreal took the safe approach and delivered a very familiar entry in the series. Again, given how you approach this game, that is either a very good thing or one of disappointment. Regardless of how I feel about certain parts of the story, the clumsy AI, or the hundreds of deaths caused by a poor traversal system, I still had a great time with everything else this game had to offer. The challenge tombs alone are worth of the price of admission, and collecting all the outfits became an obsession of mine. While I still feel that Rise of the Tomb Raider is a far better game overall. this finale is certainly one adventure I still suggest diving into. Shadow of the Tomb Raider was purchased by the reviewer.